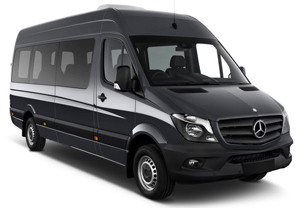 For your shuttle, taxi, or touring business, no other full-size van can match the comfort, safety, and efficiency of the Sprinter Passenger Van. With room for up to 12 people, ample head room, and available electric step at sliding door, you can offer your passengers first-class treatment. And with up to 5.4 m3 (190.3 cu ft) of cargo volume, you’ll also have plenty of room for luggage and payload. Offer ends December 31st, 2016. © 2016 Mercedes-Benz Canada Inc. 2016 Sprinter 2500 170” Passenger Van shown above with optional Metallic Paint ($1,160), and dealer fees starting from $53,260. *Total purchase price of $68,625 includes MSRP of $49,500, all option fees and all applicable dealer fees on the 2016 Sprinter 2500 170” Passenger Van (STK# S1673999-5016). Lease offers based on the 2016 Sprinter 2500 170” Passenger Van available only through Mercedes-Benz Financial Services (MBFS) on approved credit for a limited time. 2.99% lease rate does not qualify for the no-charge pre-paid maintenance package and the extended limited warranty offer. First month’s payment, security deposit of $550, plus freight/PDI up to $2,995, admin fee up to $595, EHF tire fee $25, air-conditioning tax $100 and PPSA up to $44.30 are due at signing. Vehicle license, insurance, registration and taxes are extra. Dealer may sell for less. Manufacturer order may be required depending on dealer inventory at the time of purchase. $4,000 in cash credits only applicable on in-stock 2016 Sprinter Passenger Van models at Mercedes-Benz Surrey. Vehicle must be delivered before November 30, 2016. Certain limitations apply. See Mercedes-Benz Surrey for details or call (604) 581-7662. Offer ends December 31, 2016.